Looking for Swiss turning services that are consistently precise? For over 49 years, we’ve offered precision manufacturing to companies across the country. It’s not much of a surprise customers looking for CNC turning services end up choosing the shop offering consistency that can’t be beat. Unity offers Swiss capability up to 32mm diameter, with multi-axis and automated bar loaders, allowing work to continue after hours. • 1 Citizen L32 Swiss: 1-1/4” dia, 8000 RPM, Main and sub spindle, Full B Axis, Citizen CAV Hydrodynamic Bar Feed. • 1 Citizen L25 Swiss w/Mitsubishi Control: 1” dia, 8,000 RPM, Main and Sub Spindle, SMW Quick 32 Hydrodynamic Bar Feed. • 1 Citizen C16 Swiss w/Mitsubishi Control: 5/8” dia., 8,000 RPM Main and Sub Spindle, Citizen CAV Hydrodynamic Bar Feed. • 1 Citizen K16 Swiss w/Fanuc Control: 5/8” dia., 15,000 RPM, Main and Sub Spindle, Citizen CAV Hydrodynamic Bar Feed. • 2 Haas SL20: 8”chuck x 20” long, 10 Station Turret, 10.3” Dia. Swing, Programmable Tailstock, 2” thru spindle, 30 HP 5,000 RPM spindle, Parts catcher, High pressure coolant, Tool presetter, One lathe has an automatic bar feeder. Don’t wait. 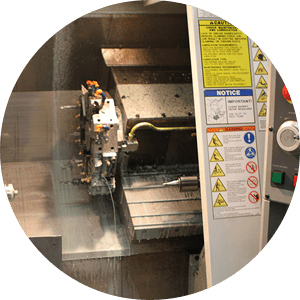 See how you can get started with our CNC turning services today. Give us a call at 763-428-9888 or request a quote.